Many people are very upset about the killing of Harambe, the gorilla imprisoned in an Ohio zoo. They ought to be upset. It was wrong to imprison Harambe. It was wrong to kill him. But what happened to Harambe is no more wrong than what happens to all of the animals we use for food (or any other purpose). Harambe may weigh more than the little chicken whose body is sold at the store for a few dollars. But from a moral point of view, Harambe and that nameless chicken are moral equals. If you object to what happened to Harambe and you are not vegan, you need to see that there is no morally significant difference between the animal you think is “special” and the animal you eat. Please recognize the moral value of all sentient nonhumans and go vegan. Abolitionists agree with welfarists that animal exploitation is not going to disappear “overnight” and that we need to take incremental steps—what welfarists call “baby steps”—to get to the goal of abolition. But abolitionists reject welfare reform campaigns and single-issue campaigns (SICs) as incremental steps because they are inconsistent with the idea that nonhuman animals are morally significant and have the right not to be used as resources for humans. Additionally, as a practical matter, these tactics do not work and, by their very nature, cannot lead to abolition. Despite claims by welfarists that abolitionists have no practical plan for change, abolitionists have a very clear program for incremental change on both the individual and social levels: veganism and creative, nonviolent vegan advocacy and education. Veganism means not eating, wearing, or otherwise using animals to the extent practicable. We should state at the outset that no one maintains that it’s medically necessary to eat animal foods. Mainstream professional organizations, including the Academy of Nutrition and Dietetics, the American Diabetes Association, the American Heart Association, the British Dietetic Association, the British Nutritional Foundation, Dietician’s Association of Australia, Dieticians of Canada, and the Heart and Stroke Foundation; research and teaching institutions, including the Mayo Clinic, UCLA Health Center, University of Pennsylvania School of Medicine, and the University of Pittsburgh School of Medicine; governmental agencies, such as the British National Health Service, the U.S. National Institutes of Health, U.S. Department of Agriculture, and U.S. Department of Health and Human Services; and even large managed care organizations, such as Kaiser Permanente, all acknowledge that a sound vegan diet is perfectly adequate for human health and some of these groups claim that vegan diets may have significant health benefits over diets containing animal products. It is also the case that there is little, if any, serious disagreement that animal agriculture is resulting in an ecological disaster. Animal agriculture results in the destruction of grasslands and top soil, deforestation, water depletion and pollution, and on all accounts, is a significant contributor to global warming with Worldwatch Institute estimating that at least 51% of annual worldwide greenhouse gases are attributable to animal agriculture. In any event, let us focus on veganism as a moral principle. He maintained that abstaining from meat was not enough, “The unquestionable cruelty associated with the production of dairy produce has made it clear that lacto-vegetarianism is but a half-way house between flesh-eating and a truly humane, civilised diet, and we think, therefore, that during our life on earth we should try to evolve sufficiently to make the ‘full journey.’” Watson also rejected eating eggs. “Vegan” comes from the beginning and ending letters of the word “vegetarian,” as Watson thought that veganism was the logical place from which vegetarianism stemmed, as well as the point where vegetarianism would ultimately lead. He avoided wearing leather, wool, or silk; and used a fork, rather than a spade, in his gardening to avoid killing worms. Watson was opposed to hunting, fishing, blood sports, and the use of animals in experiments or for testing purposes. Watson touted (and exemplified) the health benefits of a vegan diet but he clearly saw veganism primarily as a moral principle. He regarded the vegan movement as “the greatest movement that ever was” because it provided a solution to the crisis of greed and violence that affected and afflicted humankind and that threatened ecological disaster. Although he was not religious in a traditional sense, he had deeply held spiritual beliefs, which included the idea that being a nonvegan violated natural law and that, as a general matter, our violence against nonhuman animals was a violation of spiritual laws that resulted in our psychological unhappiness and physical ill-health. The Abolitionist Approach embraces and develops Watson’s position and sees veganism as representing a fundamental moral principle. 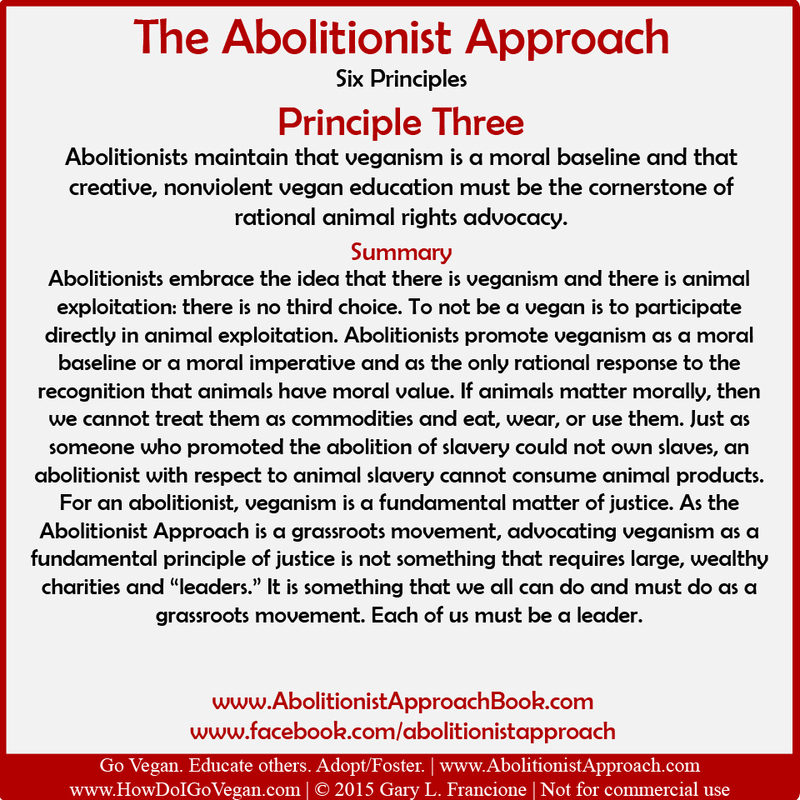 The Abolitionist Approach maintains that veganism and creative, nonviolent vegan education are the most important forms of activism and advocacy in which we can engage. Indeed, it is only through vegan education that we will shift the paradigm away from animals as property and toward animals as persons. The Abolitionist Approach regards veganism as a moral imperative. By this we mean that if animals matter morally, we are morally obligated to stop eating, wearing, and using them. That is, going vegan is not just an option for someone who agrees that animals matter morally; it is a fundamental moral obligation. Abolitionists do not see veganism as a matter of “compassion,” “mercy,” or anything other than as what is necessary to discharge their moral obligations to animals. Similarly, although some people may adopt a vegan diet for health reasons, or out of concern for the environment, an abolitionist vegan sees veganism first and foremost as a matter of moral obligation. It is what they owe to animals. An abolitionist vegan may have health or environmental concerns as well, but the primary motivating force for the abolitionist vegan is morality. The Abolitionist Approach is clear: if one is not a vegan, one is participating actively in animal exploitation. Since abolitionists reject all animal exploitation, even supposedly “humane” exploitation, abolitionists have no choice but to be principled and consistent vegans. Abolitionists see veganism as a rejection of the status of nonhuman animals as commodities. Humans exploit animals because they are viewed as things. They are property without moral value. Abolitionists reject the property status of nonhuman animals and refuse to participate in their institutionalized commodification. Abolitionists recognize that every time humans eat, wear, or use an animal product, they are reaffirming the insidious system that treats nonhuman animals exclusively as resources for humans. Abolitionists see veganism as representing a fundamental principle of justice: it is simply unfair to treat nonhumans as replaceable resources, and to deny them the one right that we accord all humans irrespective of particular characteristics. Abolitionists see veganism as an act of nonviolent defiance, as a refusal to participate in the oppression of the innocent and the vulnerable, and as a rejection of the insidious idea that harming other sentient beings should be considered as a “normal” part of life. Abolitionists see veganism as applying the principle of abolition to one’s life. Animal advocates who claim to favor animal rights and to want to abolish animal exploitation but who continue to eat or use animal products are no different from those who claimed to be in favor of human rights and the abolition of slavery but who continued to own slaves. Abolitionists see veganism as a necessary element of a nonviolent life. That is, if someone embraces nonviolence, they have an obligation to be vegan. They must also embrace nonviolence in other ways: veganism is not sufficient but it certainly is necessary. From the foregoing, it should be clear that, as far as abolitionists are concerned, veganism applies not just to diet but to wearing or using animals. In other words, a vegan is one who does not eat, wear, or use animals in their life to the extent practicable. It is impossible to avoid all animal products. Given that we kill billions of animals every year, animal by-products are available cheaply and are included in many things, such as road surfaces, plastics, and in glues used to make shoes. But when we do have a choice—and that is just about always, unless we are on a desert island or shipwrecked—we are morally obligated not to eat, wear, or use animals. We also believe that veganism means not participating in or patronizing activities that involve animal exploitation, such as circuses, zoos, rodeos, or horse racing. We do not believe, however, that veganism is synonymous with “everything morally good.” Although we talk about the rejection of human discrimination and it is an element of the Abolitionist Approach (see our discussion of Principle Five), we think it unhelpful to say, for example, that a person who is sexist is not a vegan. A person who is sexist is not an abolitionist as we use that term. But a sexist can be a sexist vegan. There is a tendency on the part of some vegans to use the term so broadly that it becomes shorthand for all the elements of that person’s view of ideal morality. That simply causes confusion. Although, as a moral matter, Watson rejected the consumption of all animal products, he thought that, as a psychological and sociological matter, it was necessary for people to pass through a period of vegetarianism first before they became vegan. He saw vegetarianism as a sort of “gateway” because he saw veganism as representing the conclusion of an evolutionary process that started with vegetarianism. Watson did not object to vegans promoting vegetarianism precisely because he viewed it as an essential part of this evolutionary process. Abolitionists reject this notion and maintain that we should be clear that vegetarianism involves animal exploitation and must be rejected. There is no morally coherent distinction between flesh and other animal products. Promoting vegetarianism as part of an “evolution” supposedly culminating in veganism is equivalent to saying that we ought to promote consuming some animal products as a way of eliminating the consumption of all animal products. In this sense, the “gateway” argument concerning vegetarianism is exactly the same as the argument for welfare reform: that we should promote “humane” exploitation as a way of supposedly achieving no exploitation. Abolitionists reject the “gateway” argument in both contexts. If humans and nonhumans are all equal in holding a right not to be used as property, then just as any sort of human slavery is a violation of that right, so is any sort of animal exploitation a violation of it. Abolitionists do not promote vegetarianism because there is no morally coherent distinction between flesh and other animal products. There is no coherent distinction between meat and dairy or eggs. Animals exploited in the dairy and egg industries live longer, are treated worse, and end up in the same slaughterhouse as their counterparts killed for meat. To not eat beef but still drink milk makes as little sense as eating flesh from large cows but not from small cows. Moreover, there is also no morally relevant distinction between a cow and a fish for purposes of treating either as a human resource. We may more easily recognize the pain or suffering of a cow because, like us, she is a mammal. But that is not a reason to ignore the suffering and death of the many billions of sentient fish and other sea animals whom we kill annually. Abolitionists do not promote campaigns like Meatless Monday, which, among other things, reinforce the idea that there is something morally worse in eating flesh than in eating dairy or eggs. All animal products involve suffering; they all involve death; they all involve injustice. Veganism is a moral imperative; it is what we ought to do and we ought not to do anything less. An excerpt from Gary L. Francione & Anna Charlton, The Abolitionist Approach to Animal Rights (Exempla 2015), pp. 70-75 (footnotes omitted). ©2016 Gary L. Francione & Anna Charlton. All rights reserved.